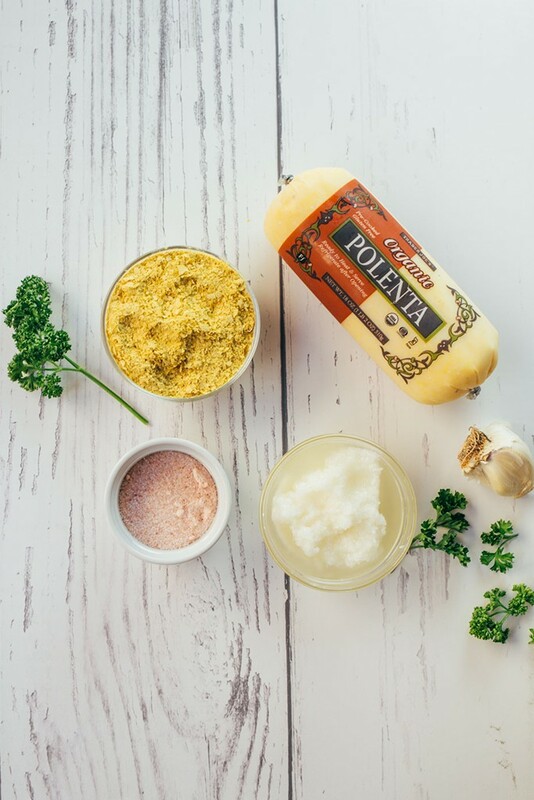 You know that funny little yellow tube sitting on the shelf next to all the pasta at the grocery store– well my friends, this is polenta and it’s awesome! Polenta is definitely a staple in my house. I love it because of it’s versatility and the fact that it can be stored in cupboard or fridge for LAST MINUTE meals. 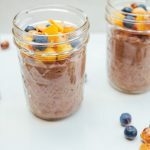 It has saved me from looking like a terrible mother who doesn’t grocery shop, to a prepared mom ready for dinner time (more than once). From creamy to crispy, we love us some polenta! 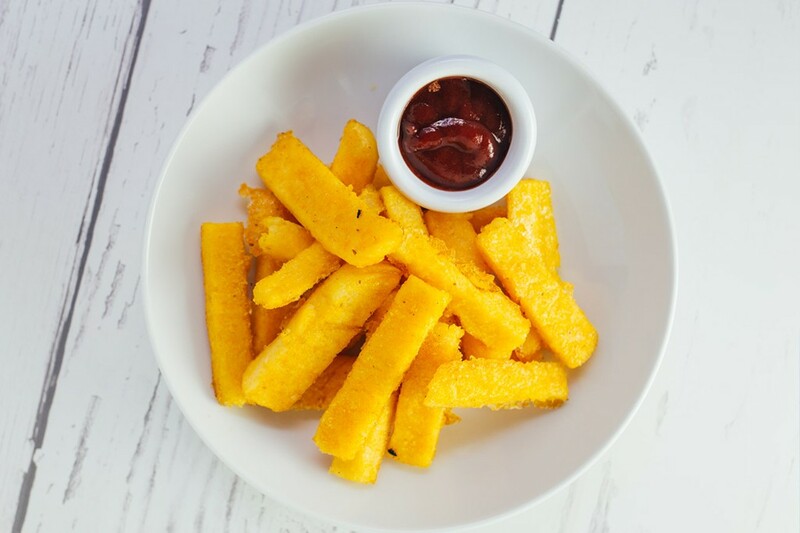 These polenta fries make an amazing side dish for sandwiches, veggie burgers, grilled tempeh/tofu… The list goes on. The ingredients are simple and there is little to no prep. Convinced yet? Get to it! 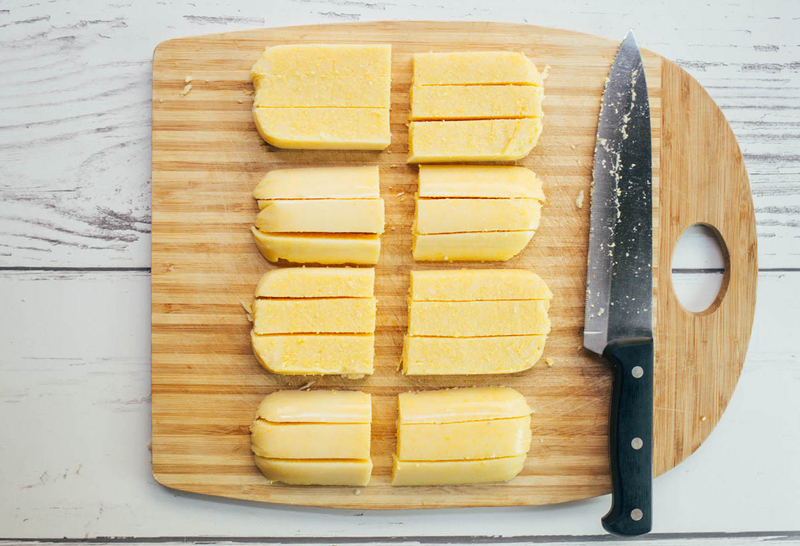 -Pop the polenta in the fridge for at least 30 minutes prior to slicing– when it’s cold, it helps the pieces stay together and crumble less when cutting and cooking. -If you have them, use little tongs to rotate fries on the skillet. They can stick sometimes so I found lightly grabbing the fry with the tong and gently moving it from side-to-side prior to turning helped “unstick” a stuck fry. 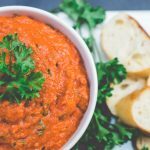 -Don’t be afraid to get creative with seasoning, they taste good with almost any flavor (Garlic, Basil, Paprika… etc). -Don’t reheat, serve ’em and eat ’em all! 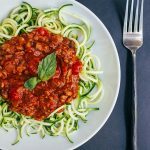 Easy dish for sandwiches and veggie burgers, or just enjoyed by themselves. Adult and kid friendly! 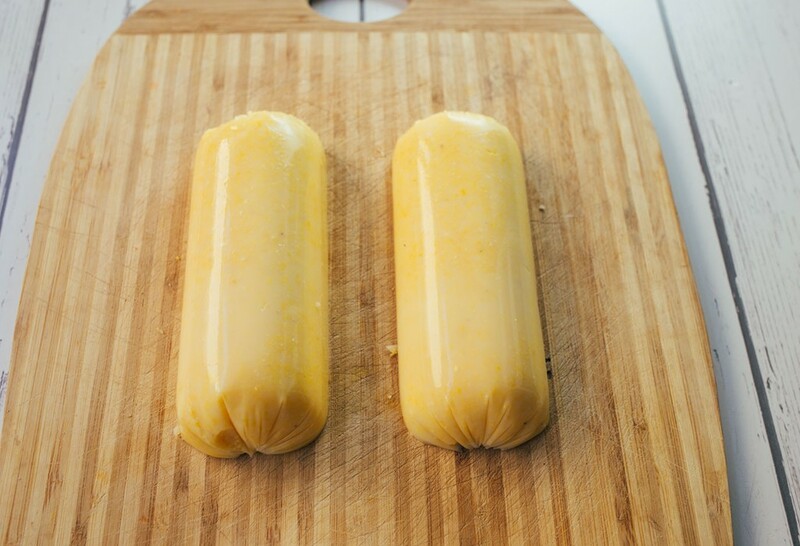 Slice polenta in half lengthwise, then slice each half one more time lengthwise again. Then take the 4 halves and slice each half into 3 fries (see photos below). When all cuts have been made your yield will be 24 fries. Heat 2 tablespoons of coconut oil in a cast iron skillet, set heat to medium low and let oil heat for about five minutes before placing fries into oil. Place fries in oil and let cook for about two minutes on all sides, rotating with tongs or kitchen tool of choice. * I used many tongs that my MIL got us for Christmas and they worked perfectly-- thanks Jenny! Well fries are cooking on the stove heat oven to 375 F.
Once fries are finished cooking for two minutes on each side on stove--take cast iron skillet and place in oven. Cook for 15 minutes, then take out and rotate once more and cook again for another 15 to 20 minutes. Remove from skillet and please onto a cookie sheet to cool for about 5 minutes. 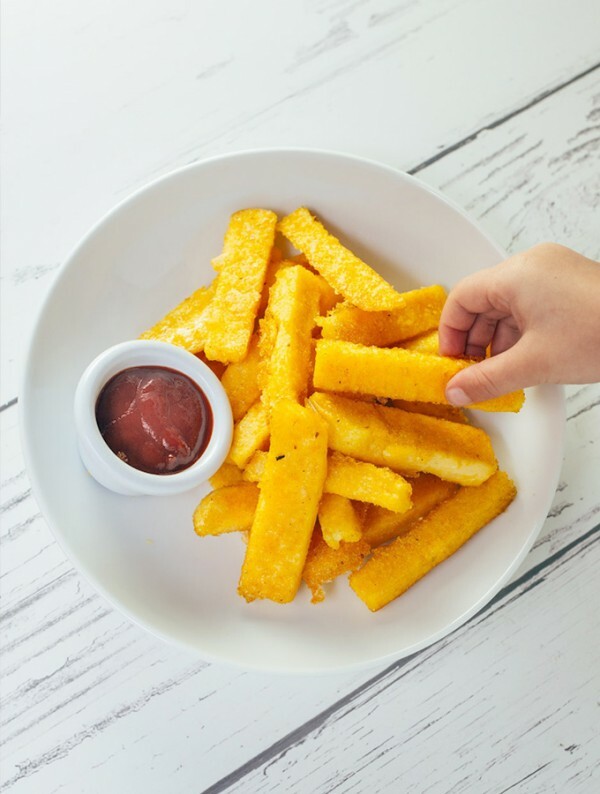 Then add nutritional yeast and Himalayan salt- by sprinkling desired amount over fries and tossing with tongs or fingers to evenly distribute flavor. For best results place polenta in fridge for at least 30 minutes prior to cutting. 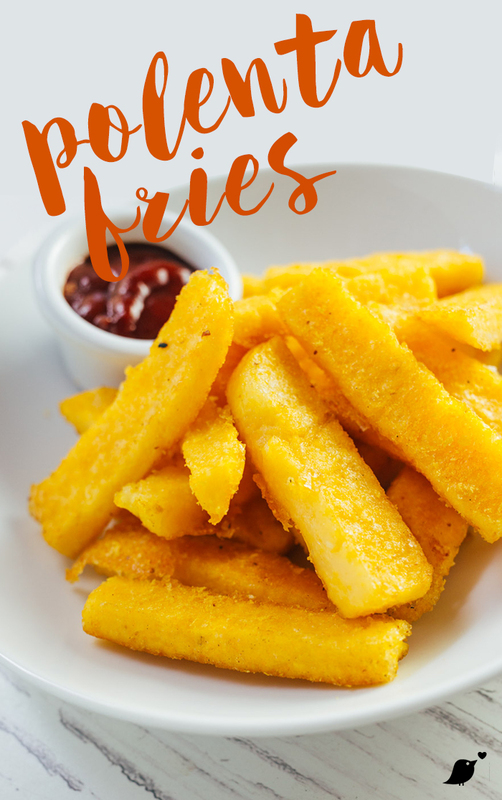 These fries are best consumed a day of cooking, they can be reheated but don't taste as good! 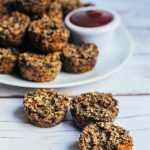 These were featured in my recent recipe as the side dish– check out my Quinoa Kale Sliders if you are looking for a good main to serve with these bad boys.